Mountain lions are secretive animals, but a UCSC team is poised to learn a lot about pumas in coming months. Photo by Daniel Stahler. A pioneering study of pumas in the Santa Cruz Mountains will generate unprecedented insights into the behavior of one of the region's top predators. Led by an interdisciplinary team of researchers at the University of California, Santa Cruz, the project will shed light on the movement, range, physiology, and predatory habits of pumas, also known as mountain lions. UCSC is collaborating with the Felidae Conservation Fund and the California Department of Fish and Game (DFG) on the project, with additional support from California State Parks. 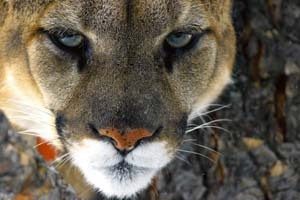 Understanding puma behavior is important as development pressures contribute to more frequent encounters between humans and mountain lions. The Bay Area Puma Project will utilize novel technology developed at UCSC to answer questions that have so far evaded scientists. Ecologist Chris Wilmers, assistant professor of environmental studies at UCSC and the lead investigator on the project, and Terrie Williams, a professor of ecology and evolutionary biology at UCSC, will team up to explore questions of puma behavior, physiology, and ecology. "We're trying to learn as much as possible about mountain lions--where they live, what their range and dietary needs are, and how to minimize conflict with humans," said Wilmers. During the first year of the project, Wilmers's team will place special tracking collars on up to five pumas in the Santa Cruz Mountains. Global positioning satellite (GPS) devices on the collars will gather location information, and a novel accelerometer on the collar will record fine-grained data on behavior and movement. Developed by UCSC electrical engineering graduate student Matthew Rutishauser, the device will literally measure the acceleration behind each footstep. "The GPS device will record the lion's location every 20 minutes, and the accelerometer will measure activity continuously, including every two-minute run, every time the animal stands still, every drink of water," said Wilmers. "Terrie will take that information about footfall frequency and convert it to calorie-burning. It will hone and refine our ability to identify corridors and habitat quality." Pumas feed mostly on deer, and the range of an individual lion varies from 20 square miles to as much as 500 square miles, depending on food availability, said Wilmers, whose other research projects include the study of interactions among wolves and elk in Yellowstone National Park. "If we want the mountain lion to survive, given all the development occurring in the area, where are the important habitats and corridors?" asked Wilmers. "How are they getting across Highway 17? How are they getting across Highway 92, or Highway 101? For that matter, how do they get from the Santa Cruz Mountains to the Diablo Range, or the Gavilan Mountains, or the Santa Lucia Mountains?" The Bay Area Puma Project will make a major contribution by gathering and linking habitat and physiology data. The project includes an advisory group of puma researchers and conservationists who will provide input and guidance over the course of the study. "Given the real factors that influence human and puma encounters, can a combination of pioneering scientific research, education, and public outreach provide a new model for human-puma coexistence?" asked project partner Zara McDonald, executive director of the Felidae Conservation Fund, a Marin County-based nonprofit dedicated to the protection of all wild species of cats and their habitats. "This is an essential component, given the fragmentation of habitat and the increase in development along puma movement corridors in the Bay Area." Mountain lions are secretive animals, so researchers know very little about their hunting capabilities beyond the fact that they surprise their prey from short distances. Williams--whose pioneering study of the energetics of marine mammals and other terrestrial carnivores, including cheetahs, African lions, and otters, set the stage for this study of puma physiology--said the accelerometer will reveal landmark details of puma hunting habits and caloric needs. "Their movement during a strike is so different from other movements that it will leave a unique signature in the data," said Williams, who will use the information to calculate the daily calorie consumption and energy requirements of pumas as they move through their daily activities. These data will eventually be used to assess how vulnerable the puma is to environmental and habitat disturbance. After pumas are outfitted with the combined GPS/accelerometer collars, data will be retrieved from the collar every couple of weeks using a remotely triggered radio uplink. Those data will be paired with GPS data to identify kill locations, and researchers will then locate and study the remains of lion prey. Wilmers plans to expand the current three-year pilot study to include the Diablo Range east of San Francisco, as well as the North Bay region. The combined GPS/accelerometer technology will be adaptable to the study of other species, he noted. Note to journalists: Chris Wilmers and Terrie Williams may be reached by contacting Jennifer McNulty in the UCSC Public Information Office at (831) 459-2495 or jmcnulty@ucsc.edu; Zara McDonald may be reached at (415) 250-0425 or bapp@felidaefund.org. About the Felidae Conservation Fund: Formed in 2006, the fund is a 501c3 nonprofit organization dedicated to the long-term survival of wild cat species and the ecosystems they support, with the goal of fostering a world where wild cats thrive in co-existence with people and the environment. Activities include building partnerships with scientific research projects, conducting compelling outreach symposiums, and educating adults and children to ensure the survival of wild cats for future generations.